I doubt they've intentionally blocked out start programs specifically, and i'm sure there will be a way to install 'incompatible' software. their far too vested in the business industry (which is actually a major focus for windows 10) to simply block software deemed incompatible.. It looks like Microsoft hard blocked the installer using the application compatibility database in Windows 10 Build 9879. Someone else reported that the Start Menu runs fine if the files are copied over from an existing installation and ClassicStartMenu.exe is executed but I haven't verified it. Or there may be workarounds such as renaming the installer but obviously Microsoft thinks there are some compatibility issues, why else would they block it? Has anyone done an in-place upgrade to Technical Preview 3 and found if it works? Anyway, getting it to work properly once Windows 10's final version is released shouldn't be impossible. At the moment, Windows 10 is changing too much, as such it doesn't make sense as Ivo said to even look into making Classic Shell compatible because it might break again. On Windows 10, which is still under development as of this writing, Classic Shell works but there are always some issues with various builds because the OS is still under development. There are workarounds for installing Classic Shell 4.1.0 such as renaming the installer but obviously there are some compatibility issues according to Microsoft. At the moment, Windows 10 is changing too much, as such it doesn't make sense to look into making Classic Shell compatible because it might break repeatedly. Update: Version 4.2.x of Classic Shell improves the support for Windows 10 but the OS is still changing. Please be patient and avoid creating new posts in the forum if possible asking about Windows 10 compatibility. I've done an in-place upgrade to Technical Preview 3 and it's the only application that got removed. With no message, btw. Someone else reported that the Start Menu runs fine if the files are copied over from an existing installation and ClassicStartMenu.exe is executed but I haven't verified it. Microsoft is just being malicious, as usual. I'll start ClassicStartMenu.exe from the Task Scheduler for now. Last edited by NoelC on Fri Nov 14, 2014 4:10 pm, edited 1 time in total. Does it work if you rename the installer to cs.exe and run it? And also the Win10 Start Menu does not work in Classic theme (even if the themes are disabled). So only Classic Shell helps. I agree that among all Windowws 6 series, Windows Vista is the most nice and functional (yet worse than XP, of course). I was always surprised why people who dispise Vista, praised Win7. So Microsoft took action to prevent users from installing Classic Shell? Nice. Can you tell me what this 'hard block' is or how it is achieved? And how or where I can see it in the TP? I hope that the coders are working on a new release for Windows 10. I have been using the Windows 10TP and am utterly dissapointed how the Start Menu is unfolding. Now that they have hard blocked Classic Shell, it is entirely irritating. I have a request for the Classic Shell team. I know that it is still WAY early, but I don't see MS doing anything about it since they are still force feeding Metro to desktop users. If someone is using 10TP they should know what I am talking about here. Would it be possible to remove the Metro 'style' things including, but not limited to; like when you click on the network icon in the taskbar it pulls up the Metro Style 'PC Settings'. I would like to see something less intrusive similar to what was in Windows 7. A small pop-up that allows you to choose a wireless connection. Ideally the removal of all Metro styling woud be what I want to be able to achieve. I haven't used Classic Shell since Windows 8 first came out, and once I got entirely sick of it I reverted to Windows 7, so I am not sure of the features that are currently present in Classic Shell. as for the metro settings, they are possible to remove yes, but classic shell hasn't tried to on windows 8, which leads me to believe that its not of priority for windows 10 either.. Since many of the settings have been metrofied, the only way to give them a classic look would be to reimplement the UI. This is a lot of work and will become even more work in the future. This is not something I am looking at right now. From what I can tell is that when Classic Shell is installed on 10TP the search and task view buttons hide the first two programs that are opened. Example; If you have 6 programs open, only the last four are visible in the taskbar because the first two are hidden by search and task view.. Since I have the search and task view removed from the taskbar this isn't a issue for me. Renamed it, and sure enough it works. Hello! With a previous build of Windows 10 Technical preview, as you already know, ClassicShell worked, except that replacing the start button made some icons dissapear. If one disables it, the icons appear properly and everything else works as usually. Recenty Windows 10 upgraded to last build (unfortunatelly without asking...) and since ClassicShell doesn't work Yes, renaming the installer installs, but ony the classic start menu works and that not always! The classic explorer and IE plugin don't work. I uninstalled it, it was no use having it. Please do make a Windows 10 compatible version. How different will the final version be (compatibility-wise) from the last build? I also noticed that the default folder icon on last build is not that nice. It would be great if we could return it to Windows 7 or a custom version. Try setting it on compability mode. please let me understand who is developing Win 10 are him Marketer or developer? And why thay are not able to understand that as well as we need the desktop we also need the start programs tree menu. After that Win10 stopped Classic Shell the only way to run non app program is to browse the Programs directory with the explorer or to digit the name in find field (if it find it...) is this acceptable? 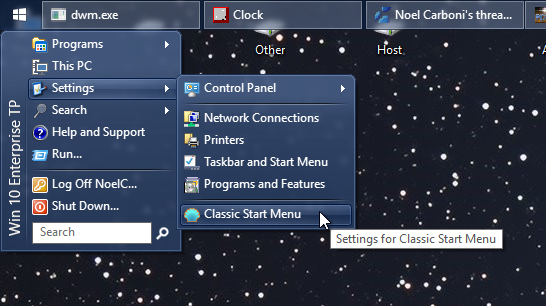 We should be able to use windows 10 menu in windows 8.1 aside from classic. Windows 10, Build 9879, installed today. 'Renamed ClassicShellSetup_4_1_0.exe' and ran a 'Repair'. Worked a treat and no problems noticed so far. Setting the installer to Windows 8 compatibility mode, didn't work. I set the installer to Windows 7 compatibility mode (for all users) and then all executables to Windows 7 compatibility mode (for all users). This did the trick and it worked once again! Win 10 updated today for me (Operating System:Microsoft Windows 10 Professional (x64) Build 9879) and now essentially treats it like a virus, all the exe's are gone, and it will not re-install as admin or in win8 compatibility mode, just give a "this program has compatibility issues" pop. Just noticed it wiped my context menu customization and open hardware monitor is fubar also. "Just When I Thought I Was in, They Push Me Back Out! .."
Actually open hardware works but rainmeter can't seem to read from it's plug-in anymore..
Got the start menu working by coping over my win81 install, seems fine so far. No explorer though, tried re-reging the dll's but no joy, not sure how to get the hooks into explorer by hand?? You can simply rename the installer and run it. Reging DLLs by hand is tricky. Repair mode seems to be the trick, I had cleaned out the remnants so it did not have anything to repair, once I copied over over my install from 8.1 it offered to repair it and all seems well again..
Gaurav mentions incompatibility in the original post of this thread, but honestly I don't see any. Seems run fine on 9841 build. Am I at fault the trigger that made M$ cause this? 4.2.0 seems to work just fine on Win 10 build 9879. Out of curiosity, what is it that it is supposed to do better? For me the released version seemed to work just fine as well, after renaming the installer of course. It handles the buttons next to the start button better. They used to overlap with the rest of the taskbar. Also the new version uses the task scheduler instead of the Run registry key, which doesn't work well under Windows 10 (possibly a bug). Edit: The latest version has reverted to using the Run key again. I have been a user of classic shell and Windows 8 for awhile.....love the features and it works really great. in software design to take a look at this. I'm using a Lenovo U510 i7 notebook. Where exactly are you right-clicking, and what do you mean by "shell mode"? I just saw win 10 and the start button is still a mess. Is the new Classic Shell going to make win 10 start button like win 7 again? It will likely work the same way it always has, though a few bugs may need to be fixed. It should work with the latest windows dev 10 release already. Can you give us, the uninitiated, a little "heads up" info on what it will be like to install Windows 10 over Windows 8.1 where ClassicShell was being used. After the Win 10 installation, will the desktop start up with ClassicShell in place just like it was for me in Win 8.1 - same Same Start Menu with my programs listed as they were, same menu preferences? Or will I need to uninstall ClassicShell in Win 8.1 before the Win 10 installation, then reinstall ClassicShell, add programs to my menu all over again (groan)? Thanks for your help. Sorry, can I get an official answer on this from the Site Admin. If you install 10 on top of 8.1 and have it keep the programs, then your settings and program listings will be preserved. If you do a clean install you will have to save the menu settings to XML and restore later. Saving your program shortcuts will not happen automatically. You have to save the contents of the Start Menu folders. It will only work if the exact same programs are installed in the exact same location. The latest Windows 10 Technical Preview (Build 10041) refuses to allow Classic Shell 4_1_0 to run. Even running as an Admin and with compatibility set for W/8 then i can only get a box "This program has compatibility issues." The latest build also changes the Windows key and e shortcut to show the Quick Access window rather than Windows Explorer/My PC (now also called "File Explorer). So perhaps a future CS version could offer a fix for that. I have posted the link to Classic Shell many times for Windows users, and hope to be able to continue to use it with W/10. Thanks. Grace and peace thru Jesus the Lord. I'm not sure exactly, but i've read that renaming the file gets it to run. try that?